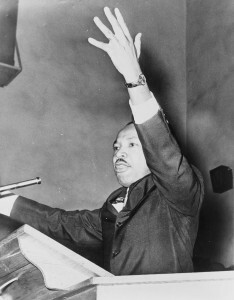 Posted bytVM January 16, 2012 January 20, 2013 Leave a comment on Dr. Martin Luther King, Jr. In August 2011, we posted an item that featured Dr. Martin Luther King. As we observe Martin Luther King, Jr. Day today in his honor, I wanted to re-post an important part of the original item from August 2011 that emphasizes each man’s obligation to act now and do the right thing. I do not believe that ‘time heals all’ or that ‘time will tell.’ Men heal wounds and resolve issues by action, not by letting time take its course. This fact was never more eloquently expressed than by Dr. Martin Luther King, Jr. in his April 16, 1963 “Letter from Birmingham Jail.” Dr. King writes his letter in response to a published statement by eight Alabama clergymen. The clergymen insisted that Dr. King’s non-violent demonstrations were, among other things ill-timed. … I want to look back without regret and say I used my time wisely and I made choices to promote the good will and welfare of my fellow man. The Vitruvian Man makes time his ally.